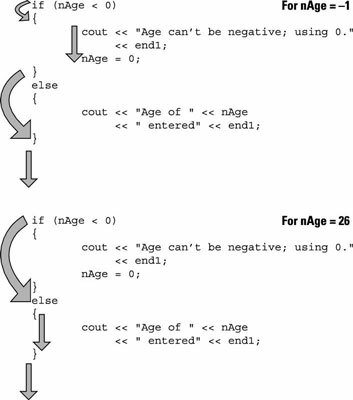 In this case, if nAge is less than zero, the program outputs the message “Age can’t be negative; using 0.” and then sets nAge to 0. This corresponds to the flow of control shown in the first image. If nAge is not less than zero, the program outputs the message “Age of x entered”, where x is the value of nAge. This is shown in the second image.